JDRF and Delta Epsilon Psi Fraternity Inc. team up every year to raise money nationally and to help promote awareness for the cause. Through our newly formed partnership with the Juvenile Diabetes Research Foundation, we have committed to the responsibility of bringing support from not only the South Asian population, but also America’ s collegiate community. As students on our respective college campuses, we see a rich atmosphere that serves as a medium in which a small message from one fraternity can become a movement, nationally as well as globally. A daunting task as it may be, we the brothers of Delta Epsilon Psi are committed to preserving the mission of our predecessors in the fight against Type 1 Diabetes because of the personal connection that every brother has to this philanthropy. The run will be Saturday April 5th! Late registration will begin at 8am and the run will begin at 9am. The run will take place at the Plinth at UTD. Don't forget to register through the link and pay! Hope to see everyone there! 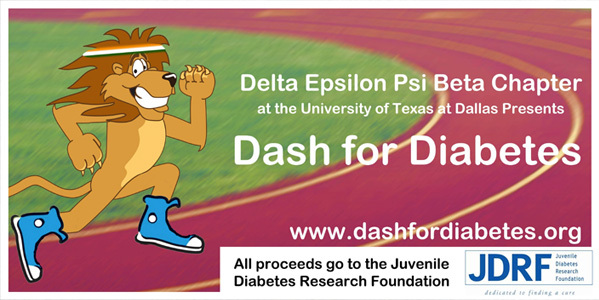 Come out and support Delta Epsilon Psi as we present our annual Dash for Diabetes. The Dash is a great way to bring the community together for Juvenile Diabetes Research. The run will be hosted at UTD, and we are hoping for the surrounding community to get involved. There will be two portions of the Dash. 1. The race portion will be about speed, and let our more competitive participants enjoy the race while still contributing to a great cause. 2. The run portion will be more about enjoying a crazy day with friends and family. Using the registration links provided, please leave your contact information so that we may be able to send you updates regarding the 4th Annual Dash for Diabetes. If you are a member of a Greek Organization, the entrance fee is $10. Each registration comes with a complimentary Dash for Diabetes tee shirt. Your entry fee is donated directly to the Juvenile Diabetes Research Foundation. The race will be a 5k, smaller variable tracks are being discussed, with plenty of water stations. Please fill out this form to register for this year's Dash for Diabetes. Please note, if you are signing up as a Runner, that you must complete both the form as well as the PayPal registration to be allowed to participate. Copyright © 1998-2014 | Delta Epsilon Psi Fraternity, Inc. | All Rights Reserved.